The 1968 Winter Olympics, officially known as the X Olympic Winter Games, were held in 1968 in Grenoble, France and started on February 6. Thirty-seven countries took part. Norway won the most medals, the first time a country other than the USSR had done so since the USSR first entered the Winter Games in 1956. Frenchman Jean-Claude Killy won three gold medals in all the alpine skiing events. In women's figure skating, Peggy Fleming won the only United States gold medal. 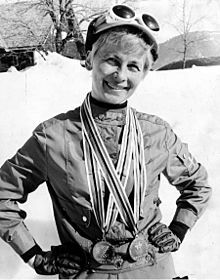 The games have been credited with making the Winter Olympics more popular in the United States, largely because of ABC's coverage of Fleming and Killy, who became very popular among teenage girls. 1968 was the first year that the International Olympic Committee let East and West Germany enter separately, and the first time the IOC ever ordered drug and gender testing of the athletes. 1968 Winter Olympics Facts for Kids. Kiddle Encyclopedia.